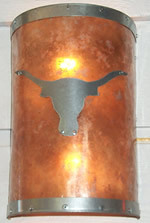 Coppertone Lighting has been creating fabulous copper lighting of all sorts since at least 2000 when they first joined Truly Texan. Janna and Dwayne have created accent lights, candle covers, nightlights, copper hanging lights or chandeliers, and wall sconces of all sorts. 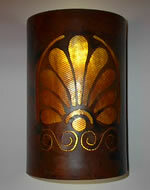 One of my favorite sconces is their galvanized one that is finished to look like leather. When I first met Dwayne and Janna at their studio, I really thought that sconce was leather. And I was standing two feet from it! So cool. They also do a lot of architectural lighting pieces including outdoor sconces that are about 7' tall. Pretty amazing. 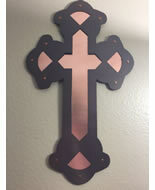 Another favorite item of mine is the copper wall hanging that looks like a 3' x 4' rug with fringed ends. I have one in my office and get so many compliments on it. So, whatever your lighting or decor needs, be sure to consider Coppertone Lighting if you want something unique. 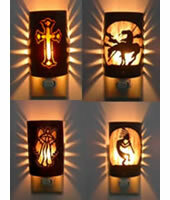 Custom designed lighting is their specialty.